1. Should I put some base cabinets or leave the space on either side of fireplace as such. I like the open area (the black walls are 27" deep behind the stone accent wall, so lots of room opens up). 2. How do I accentuate the dark walls with some complimentary artwork without turning my living space into an art gallery! I will appreciate your thoughts and suggestions! TV is WAY too high. 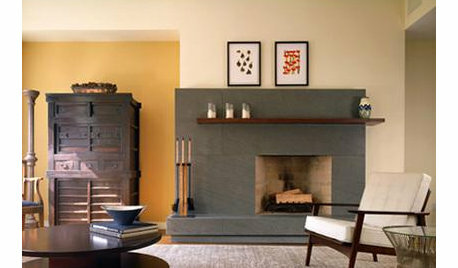 Wow in 20 years a permanent fixture like a fireplace can be outdated?!! I do not understand rooms with a TV buy no seating placed so one would watch the TV. LOL the "usual" is shelving and built-ins so this will be interesting to follow. I think your fireplace looks beautiful! I would not rush with anything, take your time..I don't think it needs much. I would first try to add some simple additions, like bright artwork that pops or cool sconces, a plant, maybe an accent chairs if there is place for it. Thank you all for your thoughts! Agree that the TV is too high, esp with the mantle gone. I do have fiddle leaf fig for accent that I took out for the picture. 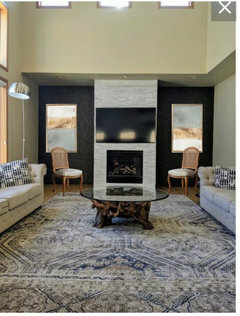 Was thinking of putting two accent chairs on the near end of the carpet, not the end next to the fireplace. We watch TV once every few months, so TV being high hasn't caused a pain in the neck. Looks great! Custom cabinets on the side of the fireplace will be great! Michelle Davidson thanked OTM Designs & Remodeling Inc. It looks beautiful. Colorful art with lots of white like the photo shopped example is very nice. Are the original cabinets still there. I can't tell in the pictures. 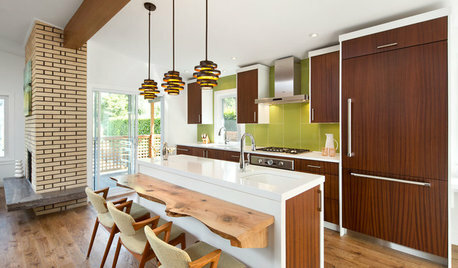 I like base cabinets, either built-ins or in the form of matching free-standing cabinets/buffets. Can you reach the coffee table from the sofas? Thank you for your comments. The current two sofas will give to a leather sectional. That provides seating for watching TV and better reach to the coffee table. 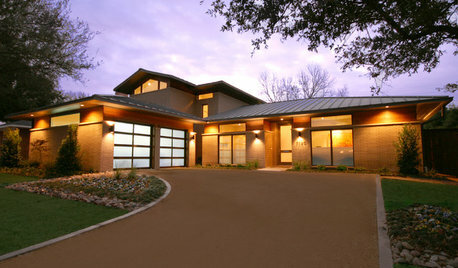 plus would open up the entire left wall which has huge windows overlooking rolling hills and tall trees. 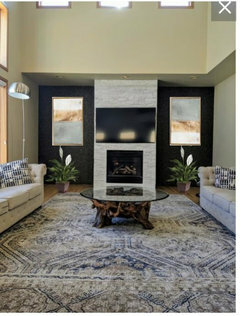 That looks like the usual TV-above-the-fireplace problem. Lower the screen to SEATED EYE LEVEL, and have it os a sing arm. Otherwise, get ready to pay the chiropractor/physiotherapist on a very regular basis. I'd go with the second choice, rather than the cabinets. I'd also do neither but that's up more to your tastes and needs. Other than that, you've done a fantastic job! It looks amazing! 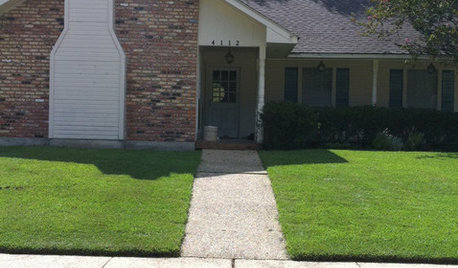 Let us know if there's anything we can do to help you! Beautiful renovation. 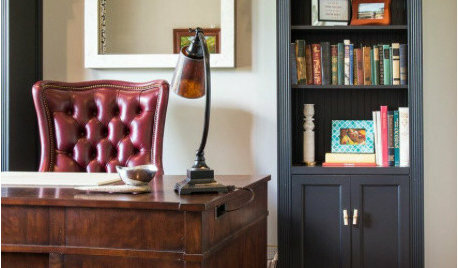 I would not block the new black walls with built-ins. 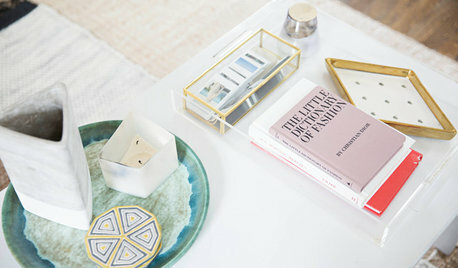 I would add matching open console tables on either side of fireplace (brass or nickel) and matching modern tabletop lamps. I would also place framed family pictures and nick-nacks on the new table tops to warm the space a little. For console tables look at Restoration Hardware's greydon shagreen, thaddeus forged or torano marble console tables. 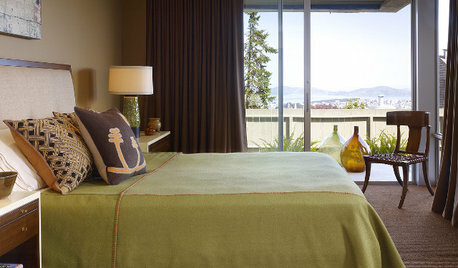 For table lamps look at Mitchell Gold & Bob Williams marco buffet, olivia table or mila table lamps. 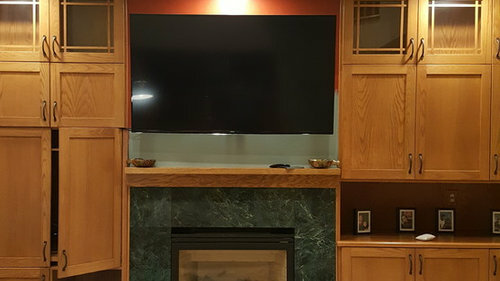 I would also lower the TV because there is too much blank space between the firebox and the tv - I would try to have an equal amount of blank space above and below TV. Thank you Keith, moving the TV to a halfway point is a great idea from a balance standpoint, even if I don't watch TV. Beautiful update! 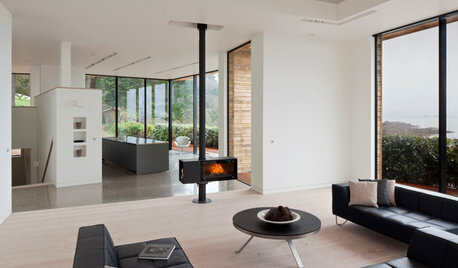 I think two side tables on each side of the fireplace would look great! 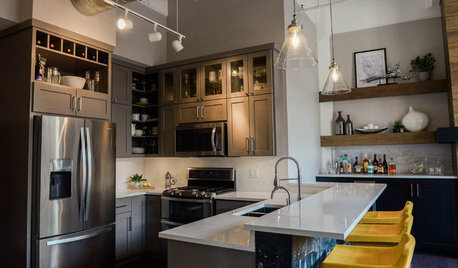 However, the cabinets would give you more storage! A couple of color-blocked pieces of abstract art on either side would look beautiful! Fireplace needs updating... Ideas please! Need Ideas on how to update basement fireplace. 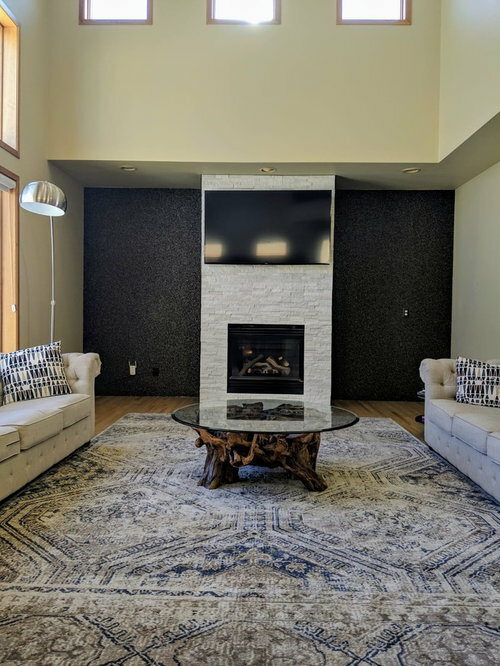 Any ideas to update this fireplace?